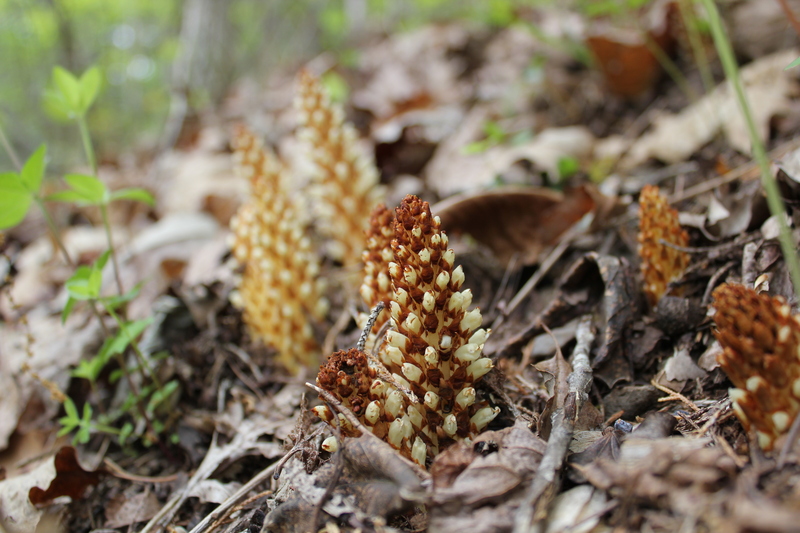 Squawroot is a spring flowering plant, but it is non-photosynthetic. Instead, it is parasitic on the roots of trees, usually oaks and beeches. The above-ground part of the plant is the flowering structure, and it looks like a pine cone, or even a corn cob (Bear corn), rising out of the dead leaves in the springtime forest. The cream-colored flowers are born around the outside of the 4 to 8-inch spike. You will often find squawroot growing in patches. After flowering, it darkens over time; later in the summer it might even look like a pile of burnt pine cones.